I have a massive amount of music to listen to, both physical Cd's and digital files. Too much to carry around, even if I wanted to. Would take up too much space on my phone, and thatâ€™s after having had to plug it to a PC and sync across. Another option would be to host the files on my PC as a server, and then use a service to access the music from there remotely. Problem, i donâ€™t like leaving the PC on 24/7, and itâ€™s reliant on uploading at the PC end, to download at phone end. Not for me. The solution to my troubles, cloud services. As a premium subscriber to Spotify (Spotify Review), all new music is taken care of. But what about the music i already own? There aren't many choices. Mspot? Its ok. The Americans have Amazonâ€™s Cloud Drive and the newly launched Music Beta by Google. 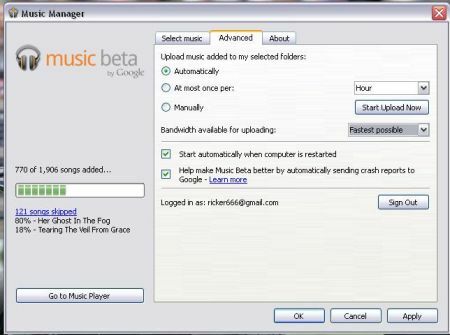 Well despite not being from the home of the brave, I too now have an invite to Music Beta..... But is it any good?First port of call is trying to get an invite. US only still, but for us enterprising Britâ€™s thereâ€™s always a way round things like this. For me it was as simple as going to www.hidemyass.com, and using their proxy to access the Google Music site. It fools the site into thinking youâ€™re in the United States, and so allows you to submit an application for an invite. Once done, itâ€™s a case of waiting an unknown amount of time, although mine appeared within a fortnight. All users now have 2 invites (Ed: Currently 4 invites) to send out to anyone they choose, and no proxy is required to set them up via invite. So if you know someone, ask them nicely! When the day arrives, the setup takes you through the usual verification, and the install of the Music Manager software. Iâ€™m really impressed with this. Itâ€™s simple, easy to use and most importantly, completely non intrusive. It will quite happily run in the background uploading your music while you busy yourself with other tasks. When set up, it will automatically upload music added to the folders you stipulate. If you use iTunes to listen to your music offline, it's as easy as telling the software to upload your iTunes library and leaving it to do the rest. Remember though, no matter how fast your broadband connection, this takes an age. I uploaded around 2000 songs initially, and on a fibre optic broadband connection it still took around 14 hours. This is the main downside to a service like this, having to upload. However once itâ€™s there, itâ€™s there. You can access it from any compatible device. Personally, it still beats having to store it all on my phone! It also struggled with DRM files attached to some of my legally purchased iTunes music. No fault of Googleâ€™s really, more another annoyance to direct at Apple! It did eventually upload all but 22 songs, a decent result. While the Music Manager isnâ€™t fancy, it does what it needs to do, and isnâ€™t intrusive in doing it. The new Music 3.0 app to partner the service is available freely in the Android Market, and can be used simply as a replacement to the stock music player shipped with your Android phone. It must be downloaded before access is granted to your cloud music, and then another little problem to overcome presents itself. In some cases (and this happened to me) it wouldnâ€™t work until I changed the language and location to English (US). As with the Internet proxy, this seems to trick the app into thinking youâ€™re in the United States, and unlocks access to your music. Once it shows up, simply change back to English (UK) and youâ€™re set. (Ed: You can get the Music apk here, and simply install it to your phone) The UI isnâ€™t anything to write home about, but at the same time it isnâ€™t displeasing. The music can be viewed by Artist, Album, Song, Playlist and Genre, with a simple swipe to the left or right changing between category. 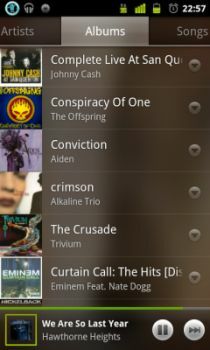 Otherwise the music is listed, with a dropdown arrow which will uncover the options available based on your selection, such as making available offline. The currently playing track will show at the bottom of the screen with basic controls to pause playback and skip to the next track. The landscape view is also pretty sweet, showing a grid of all the album art of your music. The icons are big enough to push when it's being used in a car dock, which for me is the ultimate test of usability in my life, one which it passed. Making music available for offline listening is as simple as ticking a checkbox. In a similar vein to Spotifyâ€™s mobile app, you have to select album by album, playlist by playlist etc, ticking if you want it to be available for offline use. Downloads will naturally vary dependent on connection speed, but over wifi i found downloads to happen quickly. In settings there is an option to only allow downloads over wifi, as well as streaming only over wifi. This means that if you leave wifi for example, it will automatically resume downloading as soon as you re-enter. Itâ€™s also good for keeping playlists up to date, as if you add new music to a playlist on the online music player, it will automatically download this too dependent on your settings. Sound quality isnâ€™t too bad, but it is also dependent on the quality of the file you upload. Streaming seems to be equally smooth, with the songs buffering quickly. Touching quickly on the desktop, online based music player; it works. Nothing flashy, but it works. Nothing to get excited over, it lists all your music as Spotify, iTunes etc do. It doesnâ€™t allow pinning of music to local storage as the mobile app does, but streaming is quick, with minimal buffering. You can also on this player select some freely available music. Not much, not great and just odd tracks, but it did give me some System of a Down, Lit and Umphreyâ€™s McGee which I thought was pretty decent of them. If I had to pick my main source of frustration with the whole package, it wouldnâ€™t be any connection to the cloud service. The mobile app automatically shows up all locally stored content, which includes my vast amount of podcasts that are downloaded and managed via another app. It doesnâ€™t prevent usability of the service in any way, but I enjoy a nicely organised music collection whether it be on the PC or a mobile device, and this makes everything untidy. I realise I really am picking here, but i really do think so highly of the service. Of course there are still a couple of outstanding factors that have yet to be announced. The service is still in beta, and officially only to the US. As yet the rest of the world is still waiting for a general invitation to use the service. 20000 songs is the current limit. Thatâ€™s great, I donâ€™t currently own 20000 songs. But will this become a certain GB worth of storage in the future? To accompany this, will Google ever strike a deal to allow streaming content that could replace my Spotify subscription? And finally...How much is this service going to cost when it eventually hits general release? Apple are offering their service for $25 a year, and if Googleâ€™s usual price structures are anything to go by, I wouldnâ€™t expect it to be more than Apple would charge. But no-one knows...And there lies the point. Google have come up with a first rate service, one which I feel is unrivalled outside the US to provide a service for streaming your own music. An invitation to Music Beta was enough to finally release me from the shackles of owning an iPod. Android has finally provided a solution that works, and with a bit more polish, and a content streaming service, Google will be a true force in the mobile music space.